In the following example I am going to use a combination of built-in GanttDiva features and excel macros to update the RAG status for each task based on whether the task finish date has deviated from the baseline planned date. The sample project represents a construction project where some equipment is installed roadside and in equipment rooms. There are three sections, each with the same sequence of tasks with the start time for each section offset by a set number of days after the start of the previous section. In this example, after creating the plan, I baseline it using the ‘Set Baseline – all tasks’ command. This takes a snapshot of the start date, finish date and budget for each task. The baseline finish date field will be compared to the finish date by the excel macro to set the RAG status for the affected task. The first step will be to set up the task colour coding scheme so that we will have a colour available to represent each status. It’s actually quite easy to set colour coding for tasks, so that you can set a field (in this example I will use the WPM field) to a status value and update the task to reflect a colour related to the status. In my example I am just going to create a macros for each hammock task that I created to represent the total duration of that activities covered for each section. In this case it means that I will use a macro on rows 8, 22 and 36. Basically this is a simplistic macro that only takes actual days rather than working days into account but it should be enough to show how you can define your own macro. This macro can now be copied to each of the hammock rows. In the same project I updated the duration of the planning update task for section 2 and verified that the rules described above are followed and the appropriate RAG status is now written into the WPM field. 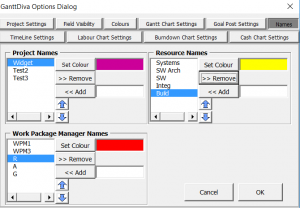 So if you have been following this example with your own project, you will notice that even though the contents of the WPM field change as expected, the colour of the task does not automatically change. This is due to one of the limitations of VBA in that there is no event triggered by the spreadsheet for a calculated change to the WPM field which is triggered by a change in the task duration. 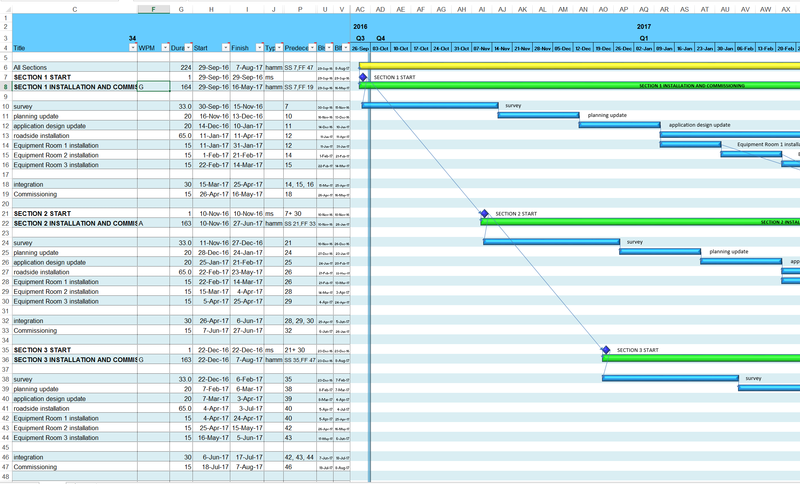 To get all tasks to update their colours to reflect any RAG status changes, you can use the “Redraw Gantt Page” command which is effectively like a recalculate command for Gantt chart. After using this command you should see any RAG status changes reflected in colour changes for the affected tasks. You can combine Excel macros with the built-in GanttDiva features to further extend the capabilities of GanttDiva to meet your needs. I have implemented a rather rudimentary way of defining RAG status, but you could also further enrich your macro to look at other factors such as EAC vs budget, a combination of schedule and budget thresholds, etc.